Although, it seem to be a xeric species, Crypt. warasii prefer some shade and more humid. This cryp. is one of the rarest of the true species. It is far more easier, in Brazil, to find a Polar bear wandering in the Amazonian jungle than to see one of these plants in cultivation here. Just one or two mortal guys have one or two. 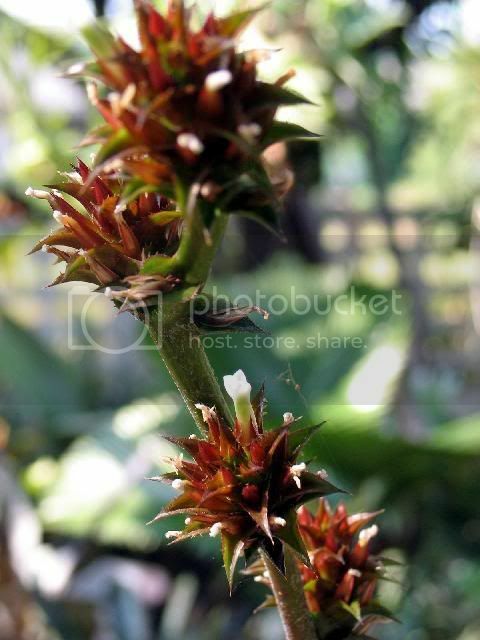 The one who discovered this species suceeded in getting it outside the country and today it is relatively easy to find it on sale in USA and some other part of the globe. An easy plant to cultivate. Mine came from Japan and it would be a shame to show it up to now. The only other I saw in Brazil was in a large cacti cultivation in Imigrantes-RS but it was dying tottaly dried out cultured as Cerrado Dyckia. 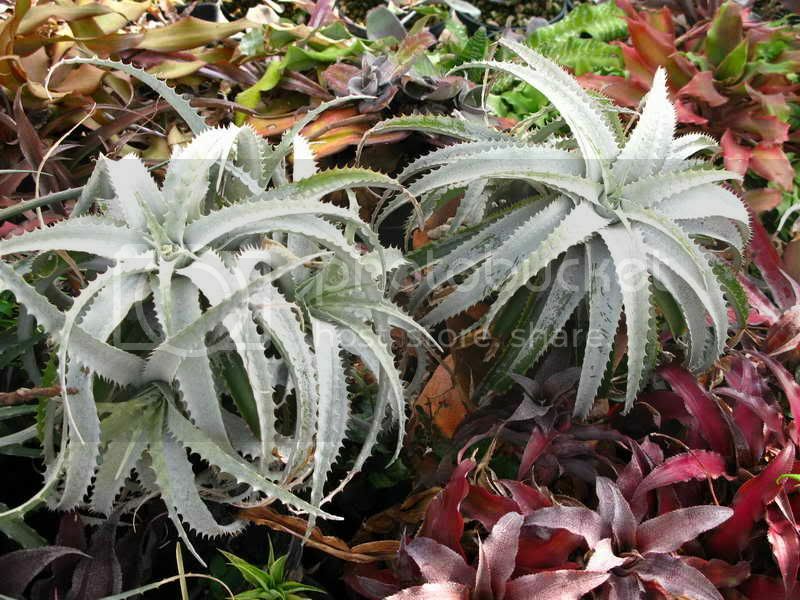 It is impressively similar to the Dyckia argentea and a no used eye would mistake the two promptly. 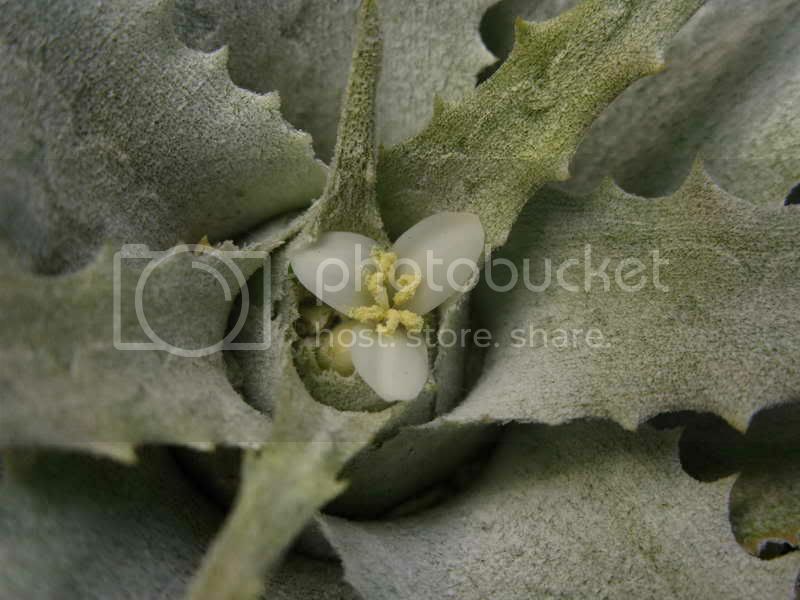 The marks on silver-grey leaves would be its remarkable characteristic. 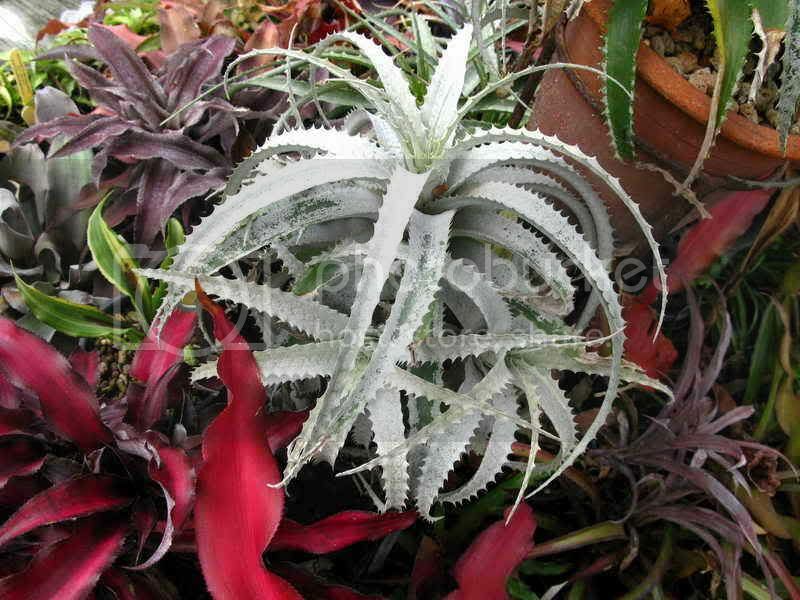 If one is not very atemptive could comite the mistake with this rare one Dyckia, In my opinion the "cadillac" of all Dyckias. It gets even bigger than this one on the picture. 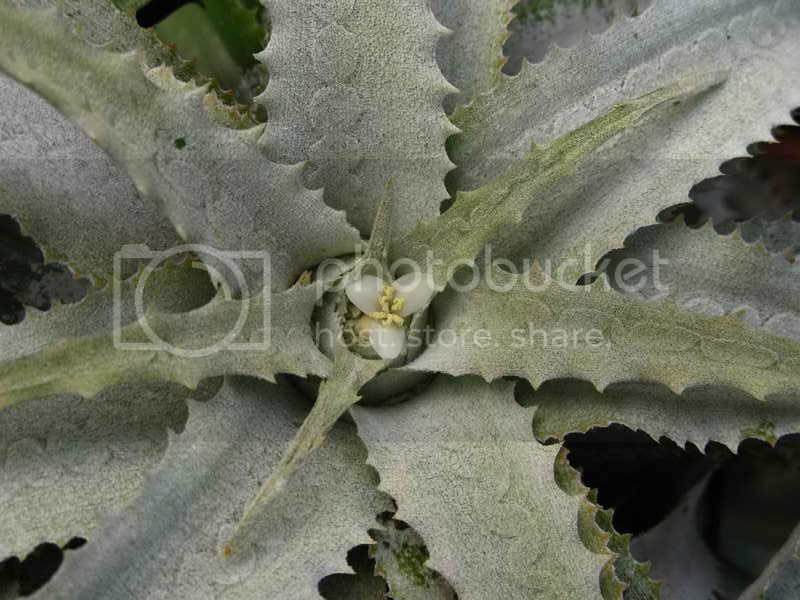 Dyckia argentea, the true and the only one form. Hi Chanin, has it ever flowered yet ? There is also a variety of Orthophytum disjunctum which vegetatively is strikingly similar to Cr. warasii, including the leaf markings. My Crypt. warasii have not yet bloomed, Timm , but my friend's plant did. Hi Joachim, yes I agree they do look alike. That why I wonder Constantino's plant look pretty close to Orthophytum lemei too. 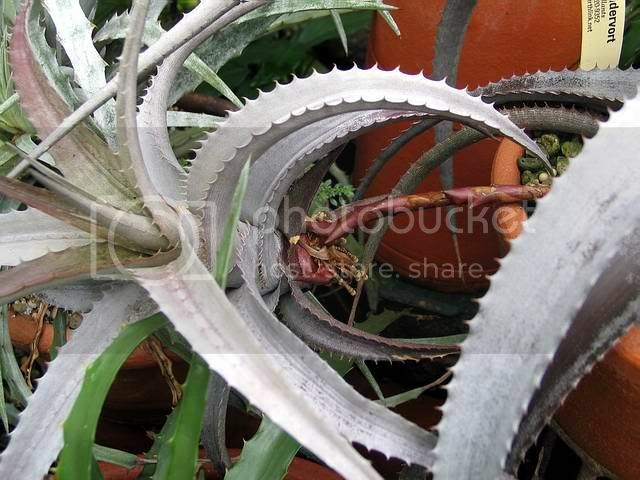 Anyway, if your plant don't do somethings like these, you will sure it's a Dyckia. Second Orthophytum lemei shoot the pup from long stolon. Yes, yes and a triple yes: they do look very like. Yes they look closely alike. I do not like Orthophytum of any species. The reason is that the plant dies after blooming. That means...if you do all the right things the plant will thank you by dying. The plant is beautiful and doing well and you are proud of it and your skills, than the miserable thing blooms get out of shape, gets taller and uglier and totally out of any good sense. I do not want this to my plants. 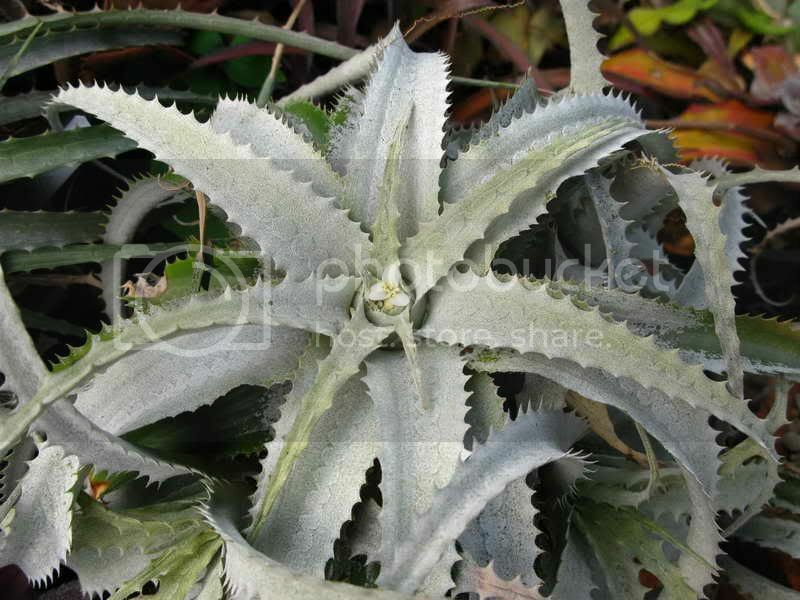 A Dyckia is always beautiful the older the better and after florishing they are even more beautifull. Ortophytuns ilude you, foolish you and I got rid of them all. Dyckias are uncomparable, the older the better. 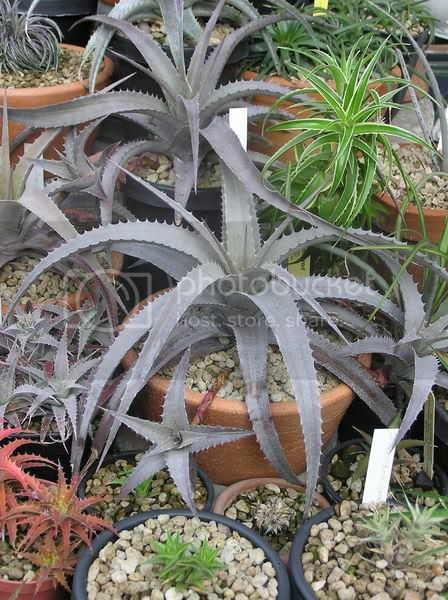 Dyckia argentea, the true one is the Cadillac of all Dyckias and gets nicer as the time passes by. 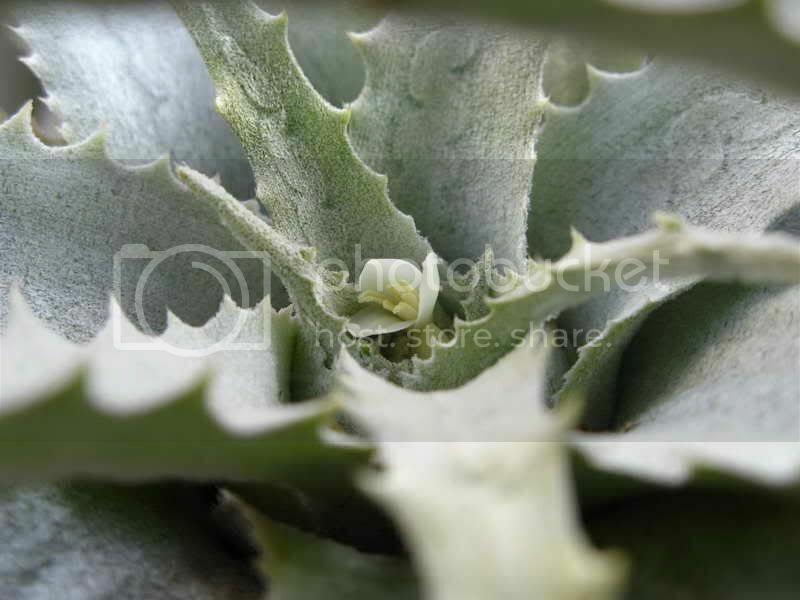 It is very hard to find even here and I think it may exist in Heidelberg ´cause it is linked to the Dyckia lindelvaldae and D. Marnier (one of the many kinds) and the guy who sent it to Germany to be described and dried out and put into drawer. Some were preserved alive, spared ( I myself think this is great.) I have just two young plants but one is about to bloom. This one I will get pure seeds. It is tottaly worthwile to try to keep the pure strain. This jewel needsno bettering. Orthophytuns are not my table, definetly. This is a nature wonder and in my opinion the super-super of all the Brazilian Cerrado( Savana like) Dyckias. Here in the South we have even more impressive Dyckias. Dyckia kernii is one of them, Dyckia Perau da Cabrita and Dyckia Dona Francisca are all much more impressive than this Cerrado beauty but even thought Dyckia are the beauty and Orthos are the beast. The photographer here is a miserable one for sure. Chanin, you are positively RIGHT! I got astonished here by and for what I knew and will tell you in details. About two years ago I was crazy and mad about some Dyckia species from our Cerrado. 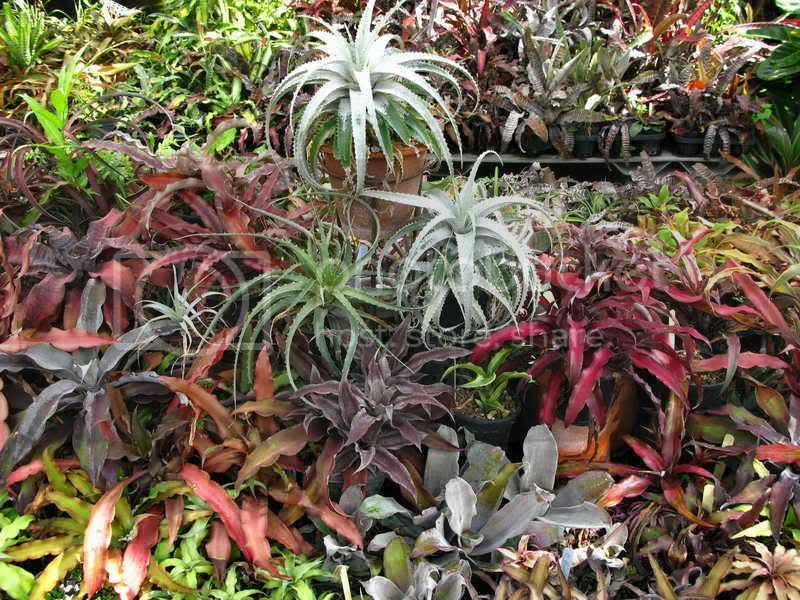 I came to know by e.mail a famous worldwide Cerrado plants collector. I had some terrifically rare Dyckias from the South and the famous guys had what I desired. We talked and talked and taked and traded. When his precious box came and was opened out came very, very dehidrataded plants. Plants without roots or roots removed and just one or two halves of leaves. They were so poor it took magical formulas to recouver and some just died. I was even so happy ´cause I´ve traded with the best known collector in every corner of the word. My plants, the ones I sent and trade were all in full growing with plenty of everything, roots and leaves. But......those plants may be the kind of good swimmer plant.s Plants that cross oceans may be dehidratades and light and bear almost no leaves and any kind of root. Hummm so these are the olimpic swimmers.....this is the form they reach the other side of the planet.....hummmmmm. That is it! So at least I know. I accepted, at least mentally accepted and wanting not to think about let´s care for the dyeing plants, some true straw! Some survived after all. 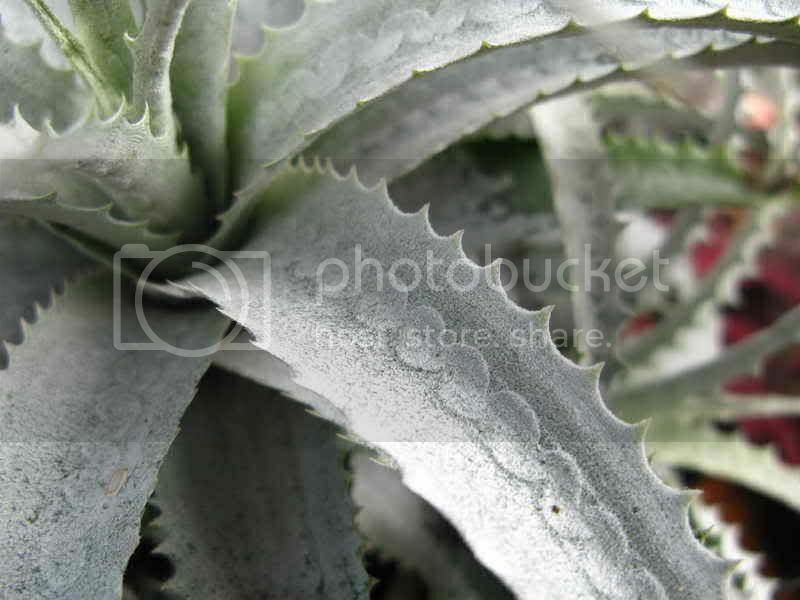 One was the Dyckia argentea. 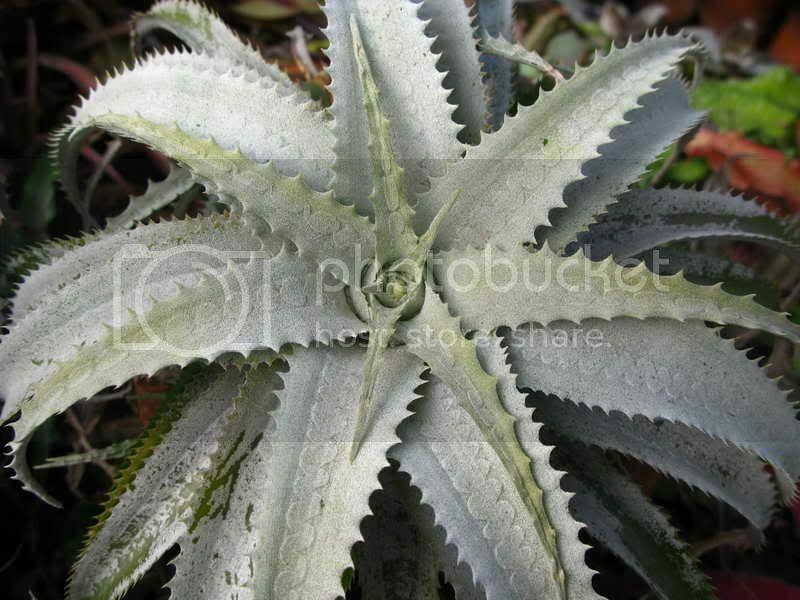 Dyckia argentea....but with that looks! 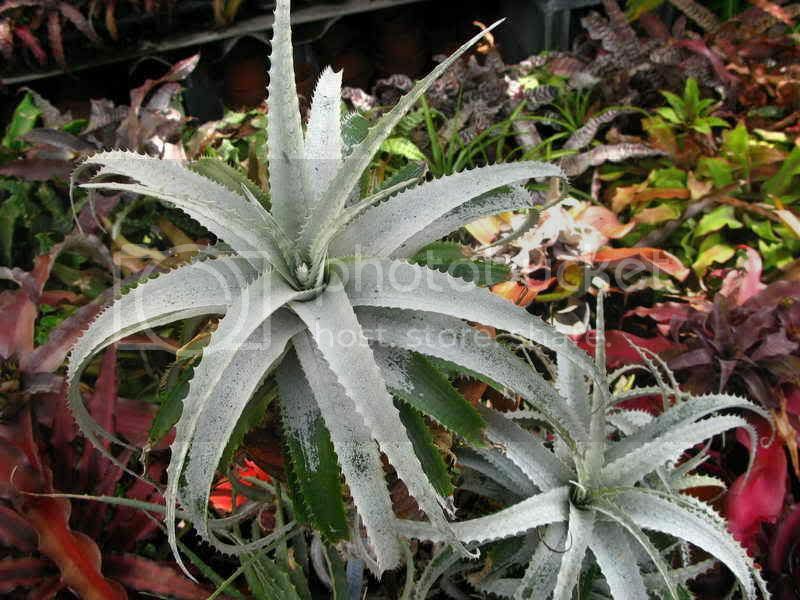 One other Dyckia argentea I have but as that guy said so..... and.. and... and guess what? That Dyckia argentea is right now flowering! To do so it is looking horrendously like an Orthophytum! I thing Orthos are undesirable plants ´cause if you do your best with them they flower and get ugly looking as a not well filled sausage. Yes that plant, that cadillac is an OTHOPHYTUM!!!!!! The world wide famous guy fooled me and maybe of course, the guy didn´t know the difference or ...does he or he doesn´t? Never mind... the plant is pretty but it is an Ortho. Maybe a new one ´cause it is a big one, two times the size of an O. lemei. But even so........it is an Ortho. That plant is a Ortophytum! I will accompany it and will take shots of it in bloom. Also I will show the Dyckiaargentea from the other source. Hi friends, finally my plants have bloomed for few days. The plant on the right is flowering too. The plant is locked by a hundred locks. A wonderful plant that likes bright sun differently from the others ordinary Crypts. This plant is a wonder of the jungle. A Real plant from the end of the rainbow. A have one from Japan that decided not to cooperate and I guess It is slowly but decidely saying bye bye to me. 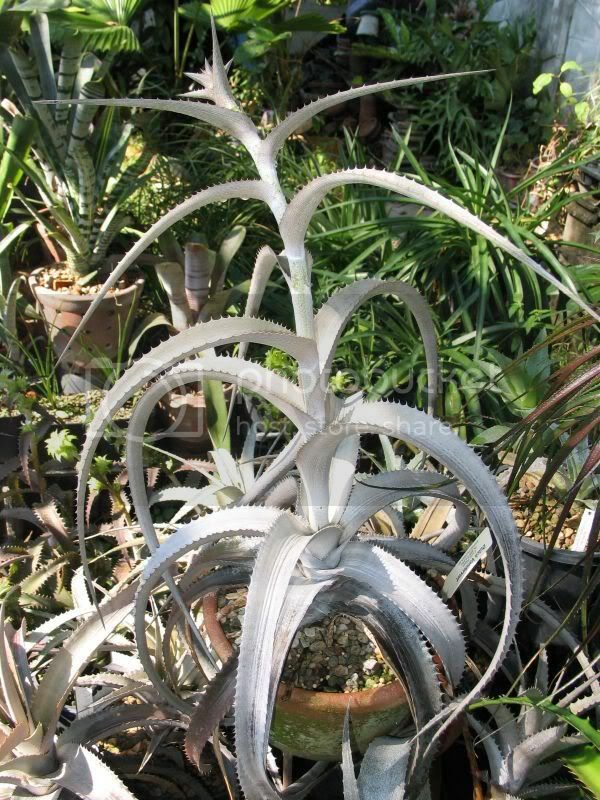 Ah, about the false Dyckia argentea and the true O. 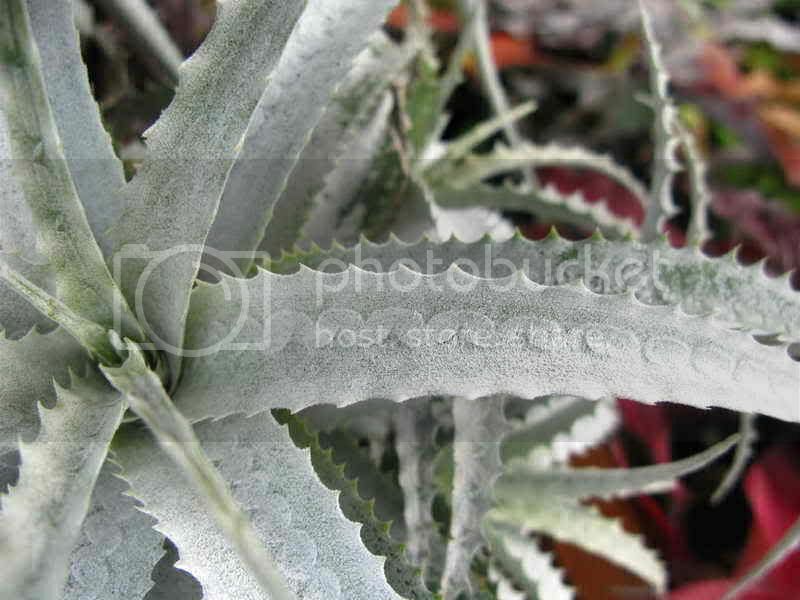 lemei...I got the true Dyckia argentea now. 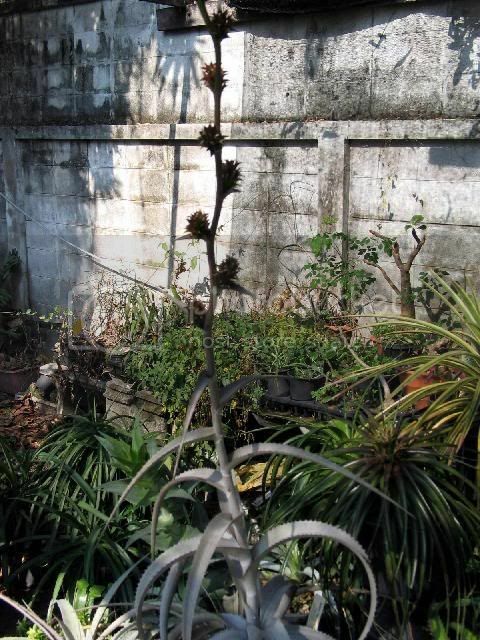 Science here decided that Dyckia argentea no more exists as well as Dyckia catharinensis, Dyckia coximensis but funny enoug all of this three grows wonderfuly in my garden. Here all these ghosts appear. We had just a bit more than 121 Dyckia species acepted but today science accepts more than 300 species of Dyckias and I do believe there are much more than this to be seen. Great plants Friend from the Tiger Land! Great!!! Congratulations!